Following on from last weekend’s luggage issues at Gatwick Airport, a number of people have suggested packing all essential items in their hand luggage rather than risk putting these items in luggage destined for the hold. We’ve compiled our list of essential items to place in your hand luggage whether it is for holiday or on business, so in the unlikely event that your luggage is lost you can get on with your trip. Local currency, traveller’s cheques, credit card etc. We always have a change of clothing in our hand luggage that is consistent with the destination we’re travelling to. So not t-shirt and shorts if travelling to Canada in the winter or a ski jacket if off to Benidorm in August. By having a change of clothing you can at least get changed after a flight and feel comfortable whilst you wait for your luggage to arrive. We obviously recommend taking as much clothing as you are permitted by the airlines hand luggage restrictions, as that way you can relax and enjoy your holiday without the stress of potentially losing your luggage. Appropriate clothes for the night, so you can get a good night’s sleep as after a stressful journey where your luggage has been lost you want to be functioning on a clear head after a good night’s sleep. Appropriate clothes for the day, so you can enjoy some of your trip and be in appropriate and comfortable clothes whilst you wait for your bag. Whilst you’ll be able to buy a range of toiletries at your destination and even some hotels and apartments may have basic toiletries, we would advise at least taking your own toothbrush & toothpaste with you in your hand luggage. Some things are hard to get in new destinations so it might be easier to take these essentials items with you than try to find them in a new country or city. Suntan lotion, if appropriate for your destination. If you lose your luggage and you’re having to stay indoors during the first few days of your holiday, you may become frustrated. So by having suntan lotion, at least you can do the waiting for your luggage by the hotel pool. Insect repellent, if appropriate for your destination. Again this allows you to enjoy your destination whilst you await your luggage. Given most people have a smartphone or even a tablet, it might be worthwhile including a charger and an adapter for any electrical item, as you may need to charge your phone when you arrive so that the airline can contact you to notify you when your missing luggage will be delivered to your hotel. You may also need your phone or tablet to check on your rights and contact relevant travel agents and insurance companies should your luggage go missing. Not just for the flight, but also whilst you wait for news & developments at your destination, its valuable to have some form of entertainment, especially if travelling with children. A simple pack of cards offers you a range of possible games doesn’t require electricity and is relatively easy to store in hand luggage. Some paper and pen are also handy to have as you may want to keep a log of what has happened, who you spoke to and what they said, in order to keep the insurance company and the airlines informed of the commitments and actions being taken. And before you leave for your trip, ensure that your hand luggage complies with the airlines allwance for hand luggage, otherwise you may be delayed at check in and pay a significant fee for oversized luggage. Just click on the airline’s name or perform a seach for the airline’s hand luggage allowances. ABTA, the Association of British Travel Agents, has advised passengers flying from Gatwick to pack all essential items in their hand luggage rather than in the hold after the luggage debacle between Gatwick Airport & the baggage handler Swissport. Last weekend saw travellers waiting for three hours for their luggage to be off loaded from some flights, and some passengers were asked to leave the aiport without their luggage. However, the challenge with packing more essential items into passenger’s hand lggage is to ensure that passengers comply with the hand luggage capacities, as if you over pack your hand luggage you may be liable for additional fees from the airlines. This comes at the busiest time of year for Gatwick as passengers take advantage of school holidays and great weather, with Gatwick expecting over a hundred thousand passengers every day over the summer break. For a list of airlines’ hand luggage capacities, please click on the Gatwick link. Following profit warnings, Ryanair commited themselves to a charm offensive to convince customers they had increased their levels of service and were worthy at least to reconsider flying with them again. The advertisement highlights in small print that “Size Restrictions Apply” but doesn’t detail the actual restrictions which may mean that flyers could be confused. Ryanair’s terms & conditions of travel do state that you can take an additional bag, but that bag must be smaller than the first piece, with a maximum size of 35cm x 20cm x 20cm but they don’t state if the second bag has a maximum weight limit although the first bag must be 10kg or less. So it’s not exactly as straightforward as the advertising would have us believe in respects of being able to bring on two equally sized bags – it they wanted to be clearer they should have said you’re allowed two bags, one which is bigger than the other. And getting it wrong can be expensive for the Ryanair customer, as the same conditions of carriage highlight that any oversized hand luggage will be charged €50/£50. But there’s consequences from offering every passenger the opportunity to take two pieces of hand luggage on to the Ryanair flights… According to the Terms & Conditions of Carriage, Ryanair will only take the first 90 pieces of cabin luggage on board the plane (from a maximum of 189 passengers each taking two pieces, equaling a possible 378 pieces of hand luggage), with the remainder pieces of hand luggage being put in the hold free of charge. Whilst this means your hand luggage will get to your destination with you at no additional charge, it will mean those passengers with hand luggage in the hold will be delayed as they pick their hand luggage up from the baggage carousel at their destination. The Dussel Professional Cabin Backpack is consistently highly rated in Amazon reviews as it is small, durable and light. The Dussel Professional Cabin Backpack is suitable for 95 out of 131 airlines we researched that fly in and out of UK airports including British Airways, easyJet, Ryanair, Thomas Cook, Thomson and Monarch, giving you confidence to buy this bag and use across a range of different airlines. The Dussel Professional Cabin Backpack has 9 pouches in all, including a specially desgined padded pouch for a 17″ laptop, so it doesn’t get superficial scrates or bumps as you place the hand luggage in the overhead cabin bins. There is a pouch in the front for easy access to documents such as passports, tickets and foregin currency. The material and manufacture seem to be durable but unlike other pieces of hand luggage there is no manufacturers warranty to back this up. Because it is a backpack, it has no cumbersome and heavy wheels and trolley system, so it is ight weight at under a kilogram, meaning it is well below the hand luggage weight allowance of even the stingiest airline. It can also collapse into a very small space when not being used. Reviewers comment on the large capacity available within the bag, again due to the fact that there is no trolley system that needs to be accomodated into the bag. 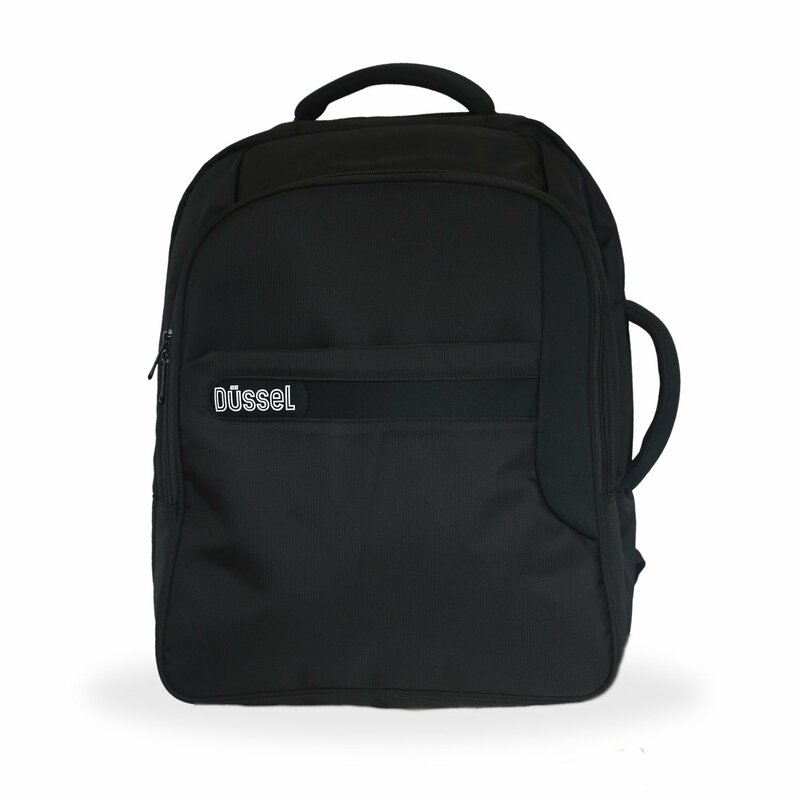 The Dussel Professional Cabin Backpack is not the most stylish of hand luggage, and is currently only available in black. Despite claims that it manufactured using a durable black fabric, there is no manufacturer’s warranty unlike the Revelation by Antler which we reviewed earlier this month. Although the Dussel Professional Cabin Backpack is suitable for a large number of the airlines that fly in and out of UK airports, it is unfortunately not suitable for Virgin Atlantic. One thing to consider with a fabric bag which doesn’t have a rigid structure to it, is that it can be overfilled which may mean that the stated dimensions may be exceed, so pack within the limits of the bag or you may exceed the hand luggage allowances and have to pay a charge. Overall, the Dussel Professional Cabin Backpack scores 4 stars out of 5 because it is light and fits a large percentage of the airlines flying in and out of the UK; has a large number of pockets and also a large internal capacity. What would improve it would be a range of colours and also manufacturers warranty. The Revelation By Antler gets 4 out of 5 stars from our hand luggage review. The Revelation By Antler is one of Amazon’s most popular pieces of hand luggage, which given its price, warranty, weight and othe rfeatures is simple to see why. The Revelation by Antler comes with 4 wheels, which each indepentedly turn 360 degrees making it easier to turn the entire case, espeically in a tight area, ideal for wheeling in and out of aircraft and trains. Some trolley based bags don’t allow you to lock the trolley extension, thus making pushing the bag difficult as the telepscopic handle will concertina in on itself it is pushed. Thankfully the Revelation by Antlet has a locking system allowing you to push as well as pull the bag, a major benefit when trying to get around an airport. It is lightweight for a trolley bag at only 2.4kg, compared with an average of 3kg for other trolley bags, which is great as it allows for more items to be taken on your trip. 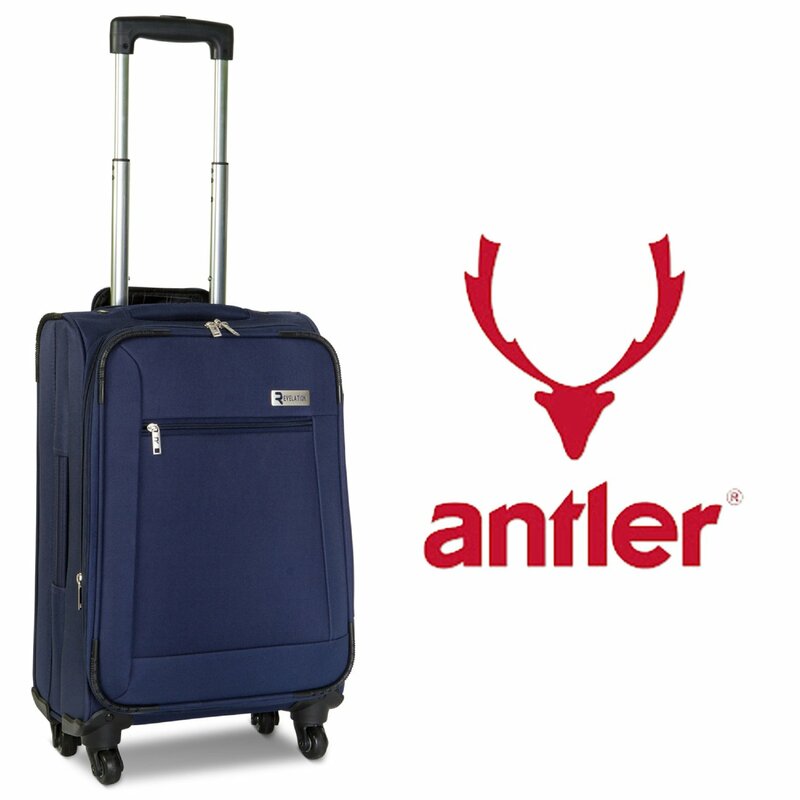 Antler are a well known brand in luggage and back up the quality of their products with a 5 year warranty. The quality of the matierials and the stitching seem to be of a high quality so I expect the warranty will never be needed. The interior has a separate internal zipped compartment which could be used for toilettires or shoes. 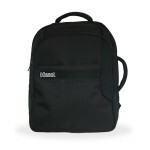 The interior also has compression straps to help compact the items in your bag, thus taking up less space. For added convenience, there is a small document wallet in the front of the bag, to make it easier to find your passport and tickets. It also comes with a small combination padlock to provide some security. The Revelation By Antler is a rather large piece of hand luggage and is only able to be used on 15 airlines that fly in and out of UK airports according to our research. It is too big for Ryanair, Virgin Atlantic, Thomson and Thomas Cook, but it is within the hand luggage allowance of British Airways and easyJet. 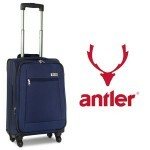 This particular piece of luggage by Antler is not their lightest 2.4 kg. This particular retailer on Amazon only has the blue fabric option. The Revelation By Antler scores 4 out of 5 from us. If you’re are looking for a dependable trolley bag, then this scores high points for us. It’s easy to push and pull, good quality manufacture and materials, backed up by a well known brand’s 5 year warranty. It could be better by having more colours on offer and by being slightly smaller to accomodate airlines such as Ryanair, Thomas Cook, Thomson and Virgin Atlantic. Kipling’s Nevada Trolley Bag has recently become Amazon.co.uk’s most popular piece of hand luggage but would not be able to be used as hand luggage on any airlines flying in and out of UK airports as its too big. It frankly is a waste of money as it is too big to be used as hand luggage and too small to be of any use when checked in to the hold. We recommend not buying it. The Kipling Nevada Trolley bag is a well designed and built to a high specification with high quality materials. The Kipling Nevada trolley bag is too big to fit even in British Airways or easyJet’s generous hand luggage allowances. It is too small to be of any real use as a piece of luggage to be checked into the hold. The price of £157 also makes it quite an expensive piece of hand luggage. Even if it was smaller, the 3kg weight of the bag would mean 35% of the weight allowance for the average airline would be taken up by the bag itself, leaving you with only 5.45kg of items to pack in the bag. This scores 1 star out of 5 as it is simply too big to be used as a piece of hand luggage on any airline flying in and out of the UK. Don’t waste your money on this bag! News today that London Heathrow Terminal 5 has long delays after a computer system for checking in checked in luggage failed. According to the BBC Website, around 500 people have been affected and need to rebook flights as the baggage system failed but the flights still departed upon time. They do add that the problem has now been fixed although they have a backlog of passengers left stranded. So if you were flying from London Heathrow Terminal 5 today, it would have been advantageous to have hand luggage only as you wouldn’t have to wait in long lines of people, just simply go through security and immigration to board your flight. This is one of the many reasons to fly only with hand luggage. One of the features of airline’s code sharing is it is meant tooffer you a much wider range of flights with only having one ticket rather thana range of tickets for each leg of the journey, so for example, you can book a round the world ticket, using 3 or 4 airlines, but only have one ticket. This is fantastic for the traveller as it means less paperwork, more routes, more airport lounges and also the respoinsibility for getting to the airport on time for onward connections is with the airline as opposed to the individual. It’s also fantastic for the operator as they can advertise and sell more desitinations without increasing costs associated with increased aeroplanes, staff, land fees etc. But there is a drawback as I found when I bought a round the world ticket with One World. The ticket I bought saw me fly from London to Singapore, then on to Perth in Western Australia, then on to Melbourne and Sydent, then the West Coast of the United States, with Toronto and New York being my final destinations. The only problem I found out was that the hand luggage allowance on British Airways was considerably higher than on its other One World Alliance members, especially Quantas. In fact Qantas made me weigh my bag for the four flights with them and although it was only 12kg nearly half the hand luggage weight allowance of British Airways, it exceed the weight allowance of Qantas by nearly 5kg so I had to check it in. Luckily for me I was flying only with hand luggage and therefore didn’t face any extra baggage charges. It is ridiculous in my opinion that when you book a ticket through an allowance that they don’t have one policy for hand luggage, even when those airlines are IATA members but do not subscribe to the IATA’s guidelines on hand luggage allowances. Have you ever wondered what possesses the airport staff to so vigorously manage Ryanair’s hand luggage allowance? Well, actually it comes down to incentives. Ryanair staff obviously have an incentive to implement the company’s policies surrounding hand luggage – it’s there job! But why do non-Ryanair staff in airports where it is a local ground crew who oversee the rules, why do they enforce the terms & conditions as zealously as if they were Ryanair staff? As part of its non-flight scheduled and Internet-related services Ryanair incentivizes ground service providers at many of the airports it serves to levy correct excess baggage charges for any baggage that exceeds Ryanair’s published baggage allowances and to collect these charges in accordance with Ryanair‘s standard terms and conditions. From that it seems that Ryanair offer an incentive for the local ground review to check your checked and hand luggage and ensure you are travelling within the limits set by Ryanair’s terms and conditions. And where you contravene these terms and conditions they ensure you pay the full amount. That is certainly my experience, both in airports where they have their own staff and in airports where they have contracted local third party ground crew. So when you’re travelling with Ryanair and you end up contravening one of their non-flight terms and conditions, don’t expect sympathy from the local ground crew as to the reason you have over packed, lost your boarding pass etc. they are being incentivised by Ryanair to ignore your sob story. As ever when flying, pack well and pack clever, but especially with Ryanair to avoid increased costs. There are two key considerations when reviewing hand luggage allowances. The first is the hand luggage size, measuring the height, length and depth of the hand luggage. The size must include any handles, wheels, or trolleys that are part of the bag and are measured at when these parts are compressed. The second is the weight of the hand luggage including any wheels or trolleys. We spent months researching, reviewing and calculating all of the airlines that fly in and out of the UK and their respective hand luggage allowances. The most generous hand luggage allowance in terms of size is a joint prize to the airlines that meet the recommended IATA standard of 56cm x 45cm x 25cm. Balkan Holidays , BH Air , British Airways, Eastern Airways, easyJet, Finnair, Iberia, Jet2.com, Onur Air, Small Planet Airlines, Thai Airways, Titan Airways and WOW air are all joint winners in the hand luggage allowance. Congratulations and thank you for allowing a sensible amount of hand luggage. The most generous hand luggage allowance in terms of weight is British Airways that allows a whopping 23kg. That’s the equivalent to 9 house bricks, although why you would want to carry 9 house bricks in your hand luggage is another matter. The airline with the least generous hand luggage allowance in terms of size is Blue Islands with only 40cm x 30cm x 20 cm, a paltry 24Litres capacity. Its fleet of aircraft is predominantly smaller aircraft such as the Jetstream 32 and ATR42 so the space available for hand luggage is less than widered bodies jets. The smallest weight allowance for hand luggage is 5kg and is shared by a number of airlines flying in and out of the UK, including Azerbaijan Airlines, Balkan Holidays , BH Air , China Southern, Helvetic Airways, Iran Air, Iraqi Airways , Nouvelair Tunisie , Small Planet Airlines , TAM, Thomas Cook , Thomson Airways , Titan Airways. Some of those also have charges and fees for hand luggage that exceeds the 5kg allowance. This has been a extremely valuable piece of work for me just in finding out the variety of hand luggage allowances. I was expecting to find a range of allowances, but I didn’t expect to find 31 different size allowances out of the 131 airlines that fly in and out of the UK. I was not surprised to find that despite 243 airlines being members of the IATA, only 13 actually comply with its recommended hand luggage allowance.